backed by the power of our facility management software. iSpec is backed by our powerful facility management software and that's what sets it apart from the competition. It's easy to develop simple apps. But, none of them are backed by 25 years of development. Invest in $200 Windows Tablets and nobody can beat our price. Otherwise, if you want to work on phones or iPads, we'll beat most of our competitor's pricing and kill them on our service. You can operate the software on a phone, or, if cost is a consideration, save service fees with inexpensive Windows tablet(s). The video shows how it works: as you can see, it's easy to use and can track the quality of any process you care to image since everything is completely customizable. We help you get up to speed quickly by importing your first million square feet of space inventory at no charge assuming it's available in spreadsheets. Why use a kid's toy hammer when you can use a Nail Gun? iSpec Mobile can be purchased separately or as a module attached to our complete facility management software package, iManage Core. Otherwise, purchase it as a standalone inspection system and you still get iManage Core with the labor calculation engine enabled for 250,000 SF, but still an extremely powerful tool, nonetheless. 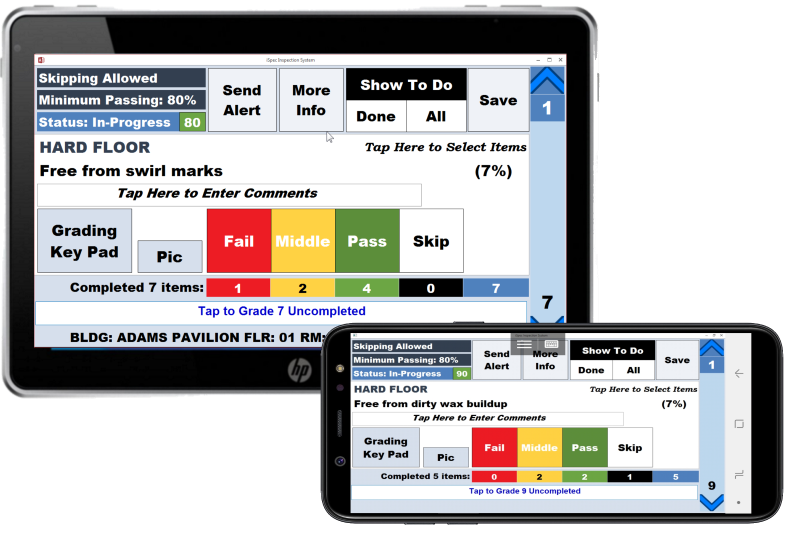 For example, you can generate bids, create task lists, work assignments, manage equipment and supplies, and enjoy the many powerful tools we created over the years. And, it gets better: At no additional charge, we include enough time to get you up and running quickly, complete with spreadsheet-based development of your space inventory, along with room classification and inspection template setup. Think of the inspection templates as electronic "checklists" and you'll get the picture. While we start you out with generic templates, every business is different and has different needs. Thus, if you're doing property management, you'll need a different set of templates than if you are doing contract cleaning. Just send us any existing checklists, and we'll set it up for you. Finally, we offer a 90-day, no risk trial. Yes, we'll help you set up the software, license your desktop for iManage Core and license your tablets with iSpec Mobile and spend the time to get you set up. If, after 90 days, you are satisfied you can purchase or lease the system at very competitive pricing.